Coral predators, or corallivores, can cause significant damage on coral reefs when population outbreaks occur. 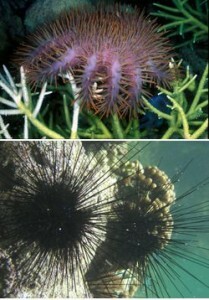 Such predators include a range of echinoderms and mollusks. Coral predators cause tissue loss in corals because feeding involves the removal of live coral tissue. The amount of tissue loss depends upon the number and type of coral predator, their size, and the frequency of their feeding. Overabundance of COTS and Drupella can accelerate bioerosion, reduce coral cover, reduce topographic complexity, and drive phase shifts from coral to algal-dominance on a reef. Although sea urchins are also coral predators (because they graze on corals and play a major role in bioerosion), they are also critically important herbivores on coral reefs. In addition to COTS, sea urchins, and Drupella, some fishes (such as butterflyfishes, parrotfish, puffers, triggerfish, filefish, wrasses, and damselfish) also consume live coral tissue. Although corallivorous fishes are not included in this section, a brief discussion of their role in coral reef ecosystem dynamics is included here.